Owing to our qualitative collection of products, we have gained enormous goodwill in this domain by presenting Submersible Motor Cables. The offered cables are widely used for power supply in submersible at an assortment of places. In order to fabricate these Submersible Motor Cables, our inspired professionals use quality-tested raw material and futuristic technology. 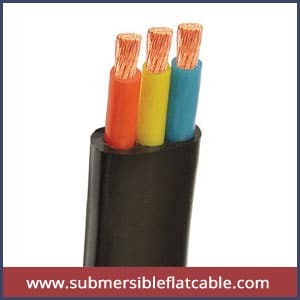 Additionally to this, our precious clients can purchase these Submersible Motor Cables from us in numerous specifications at affordable prices in bulk. These Submersible Motor Cables are created from best quality electrolytic copper drawn, on-line annealed and bunched on automatic developing machines. The conductors are insulated with a unique grade of PVC and outer sheath consists of a highly abrasion resistant PVC compound. These cables are processed on complicated twin extrusion line meets and withstand the severe requirements of submersible motor power supply.